In the middle 1800's when the Canal was being planned to run adjacent to the Maumee River, a certain dilemma had to be addressed before the canal could be built. That dilemma involved all the tributaries and small creeks which emptied into the river. Given the fact that the waterworks of the canal required very specific water levels to operate as designed, and the fact that the runoff streams would cause many fluctuations in the volume and level of the water which would be detrimental to the canal operations, a solution needed to be found to allow the runoff water to feed into the river without allowing it to enter the canal. The solution was to construct culverts which would carry the runoff waters from the streams underneath the canal and into the river. 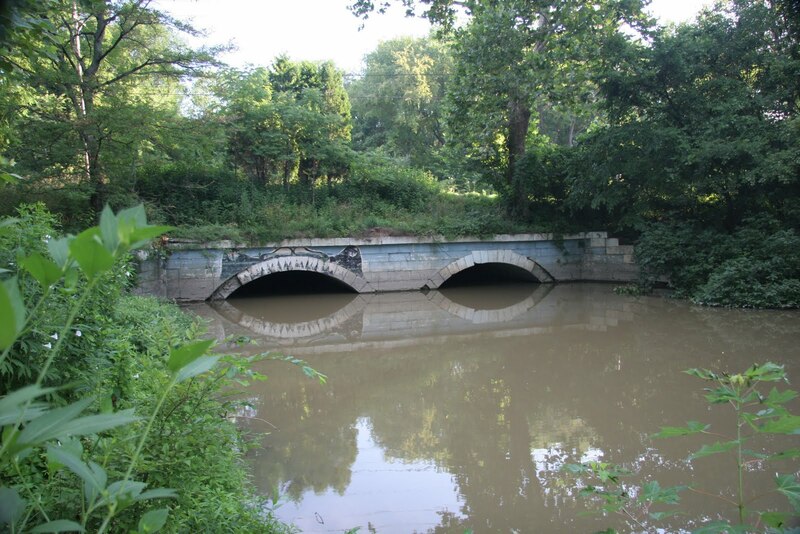 In order to accomplish this, the Culverts had to be built over streams and low-lying drainage areas during construction of the canal. Stone was brought from a quarry near Grand Rapids Ohio on the Muamee River by poled flat boats and then by horse and wagon to the building sites. A heavy timber form was constructed before stone could be laid. 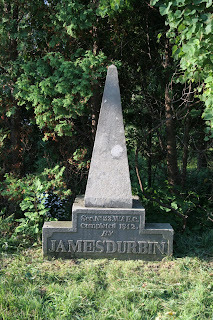 The stone was cut on site and placed over the wood form one section at a time. No cement was used in the construction of the culverts. It was cut (or finished) so accurately that few leaks occurred. Keystones were dropped in place at the top of the structure before the wood form was dismantled and reconstructed for the next section of stonework. These graceful arched stone culverts were an amazing feat of engineering even by today's standards, let alone the standards in the middle 1800's! 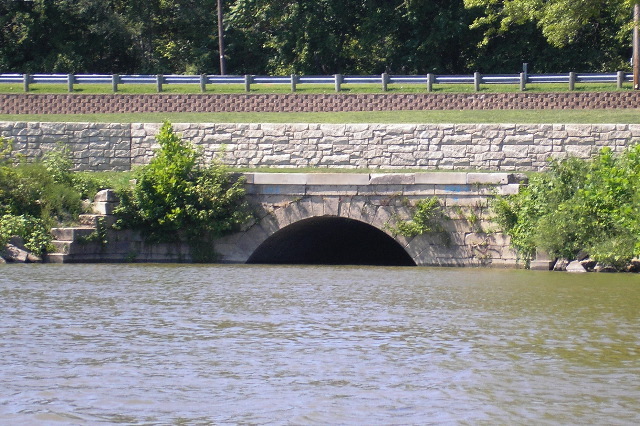 Based on the standard dimentions of the Canal, the length of the culverts needed to be long enough to run the entire width of the Canal alignment. The Canal was to be at least 40 foot wide at its surface and 10 feet for the towpath. Also there would have been some width for the opposite berm. 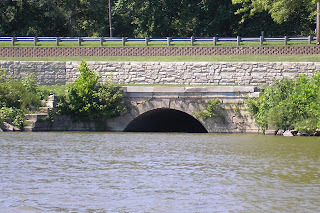 This means that the length of the culverts is estimated to be no less than 60 feet! 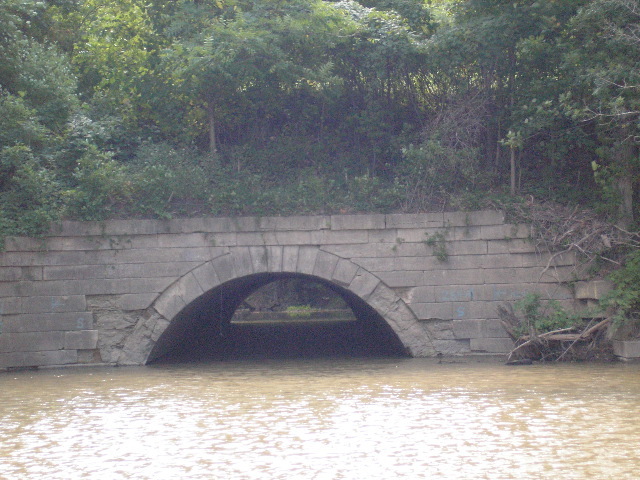 An informal count revealed around six stone culverts in Henry County. Benien Creek near Road 15C, Garrett Creek in Ritter Park, Oberhaus Creek near Tullock's Marina, North Turkeyfoot and Dry Creek in Mary Jane Thurston State Park, and finally Bad Creek in Texas. 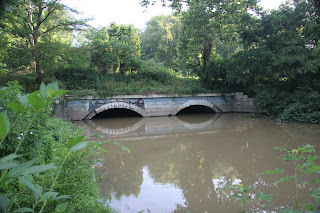 The culvert in Texas at Bad creek is unique because it has a double arch instead of the normal single arch used throughout the M & E Canal. Also the builder of the Bad Creek culvert was so proud of his culvert he built a small monument to himself on the towpath. These graceful arched stone culverts used stones that were cut by hand, and were constructed by hand in the middle 1800's. While hiking on the trail, catching a glimpse of these amazing structures will make you contemplate the complex nature of what technology and technique went into the contrruction of not only the canal, but these culverts which went underneath as well! All this in the middle 1800's!! Information and photographs about the culverts in Henry County, Ohio were supplied by Joe Krueger and Bob Morrison.